Unless you’ve done the winter circuits in Florida or California, you’re probably thinking about your first show of the season. And for many of you amateur riders, this might be your first show season ever. 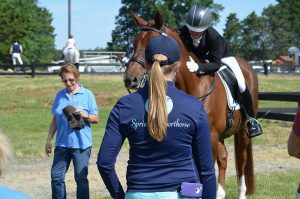 As I watch my own students make their plans for the year, I wanted to share some musings on showing from the trainer’s perspective—mistakes I see riders make, both in and out of the ring, that make their lives so much harder and shows so much less fun. 1. Remember this is supposed to be a pleasurable experience. Amateur or professional, this is supposed to be fun. No one gets into horse training for the money; we do it for fun. And I’ve never met an amateur who feels obligated to ride; they choose to do it, again, because it’s fun. So lighten up. Take a breath. Enjoy the journey. When it all goes to hell in a handcart (which it definitely will, at some point), you’re allowed between 10 minutes and 12 hours of pouting, doled out on a sliding scale of the severity of the disaster. (One bad ride at local show on green or new-to-you horse: 10 minutes. Calamitous performance at the National Championships: 12 hours. Fill in the middle as you see fit.) Pouting shall, under no circumstances, involve crying in public, shouting at anyone, taking any of your feelings out on your horse, or generally making a scene. I recommend, once you’ve gotten your horse and your equipment put safely away, getting in the car and driving to Dairy Queen. Just as a trailer ride to the vet cures many colics, the car trip to Dairy Queen bolsters the spirits of most failed competitive endeavors.